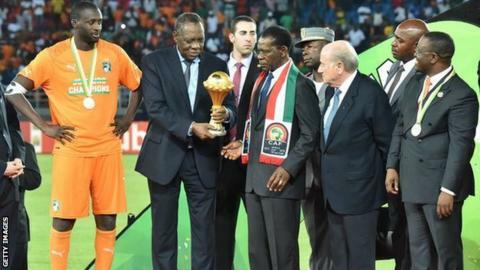 The Africa Cup of Nations in Equatorial Guinea has been described as "miraculous" by the Confederation of African Football general secretary. Only in November original hosts Morocco's plea to delay the event was rejected, leading to its relocation. And despite a riot and poor facilities, Hicham el Amrani rated it a success. "Based on the time we had, and the circumstances, making it happen the way it happened was miraculous - nothing short of that," he told BBC Sport. "We're happy about the whole organisation, in general, with the time we had and the resources we had, and I think it was quite something to have been able to have a tournament that ended up well." However, the tournament, which ended on Sunday with Ivory Coast beating Ghana on penalties to lift the trophy, will be remembered as a controversial and troubled one. Crowd violence marred the semi-final between the hosts and Ghana, when play was interrupted for 30 minutes as missiles were thrown from the stands, forcing Black Stars fans to gather on the field behind a goal for their own safety. And there was a hotly-disputed penalty decision in Equatorial Guinea's quarter-final win over Tunisia, whose players needed to be restrained as they chased referee Rajindraparsad Seechurn off the pitch at the end of the match. Tunisian Football Association president Wadie Jary was suspended from all activities relating to Caf and Tunisia must apologise to Caf by 31 March for accusing the body of cheating or be banned from the 2017 tournament. Caf also banned Seechurn for six months for his "poor performance" in the match. "We are not pleased with some incidents that happened in a couple of games, but this is part of football," said El Amrani in an exclusive interview with the BBC. "Thank god no casualties happened (at Equatorial Guinea's semi-final in Malabo)- or no major injuries happened on the pitch. We had a few people injured but those were very light injuries. "We are very sad and sorry about that [crowd trouble] happening - but the best way of dealing with it is to work on its prevention in the future, rather than just try to find the wrong causes that created that." El Amrani also defended Caf's decision not to punish Equatorial Guinea fans for their violent behaviour, instead fining the football federation and warning the team would have to play behind closed doors if there was a repeat offence. "After everything Equatorial Guinea did, and the fans as well - in general they were very peaceful, supportive - we realised that the guarantees received by the security authorities for the third-place play-off were sufficient to allow the fans to watch their team for the last time in the competition," he said. "We felt it would have been really unjust and unfair to spoil the whole party of a month that was organised, a party also for the youth. We told them we were extremely disappointed." Overall, El Amrani believes the tournament was "better than expected". "We were delighted by the crowds that came, delighted by the beauty of the smaller sites that were unknown to the public in general before - Mongomo and Ebebiyin - Equatorial Guinea did a fantastic job. "From a general perspective, I think games were very interesting - the goals, the quality of the play, technically and tactically. "We are grateful to the hosts for having been able to receive such an important tournament - and organise it in 50 days."